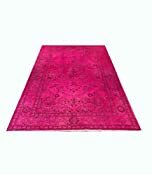 It is %100 handmade carpet.All colours are natural dyed. 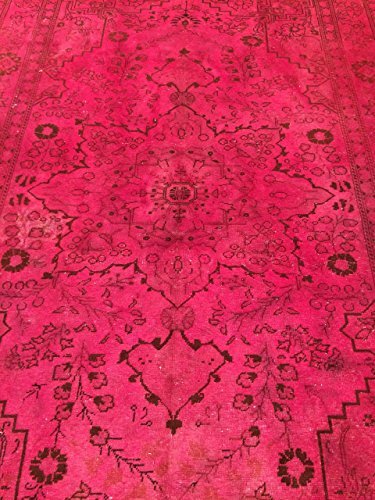 Size:4.9x7.10 feet 144x237 cm Material:wool on cotton Vintage Overyed Rugs which are dying of old handmade rugs are a new trend in the world. Old handmade rugs are collected. They are put into a wooden spinner to get rid of dusts on the rugs. After this process, the rugs get shaved carefully. Then, they get washed with carpet washing machine. After that, they are left under the sun to lose their colour. Discolouration process makes the colour on the rug pastel. However, this process does not distort the patters of the rugs. After discolouration, rugs get dyed with special wool paints. The pattern on the rug becomes more visible and it gets an amazing look. And for the last process, they are sent to our rug experts to cut their fringes and fix the edges. After all these processes, 100 % natural wool and cotton handmade Vintage Overdyed Rugs are ready to be used.Code:B175 Fast Worldwide Shipment in 1-3 business days after the order and it may take an additional 3-5 days for delivery. All items are shipped by Fedex and Ups.Please note that light effect, monitor's brightness, contrast etc. may cause a slight color difference on items. I do not edit the colors of my pictures and strive to show my items as they appear in natural light. Colors may vary slightly depending on your computer's monitor settings.